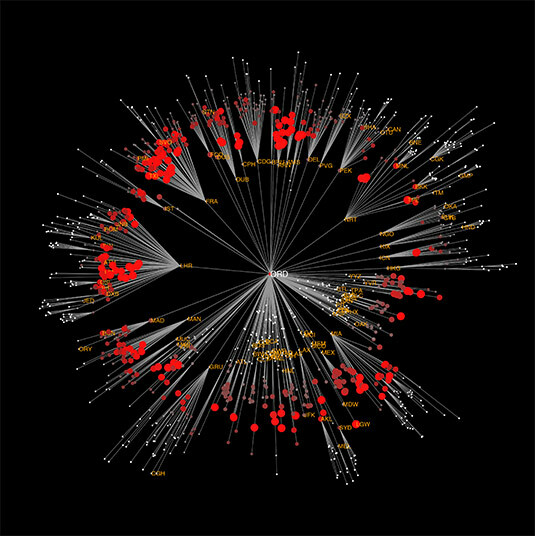 In a world of increasing global connections, predicting the spread of infectious diseases is more complicated than ever. Pandemics no longer follow the patterns they did centuries ago, when diseases swept through populations town by town; instead, they spread quickly and seemingly at random, spurred by the interactions of 3 billion annual air travelers. A model developed by Dirk Brockmann could provide better insight into how today’s diseases strike. Brockmann, associate professor of engineering sciences and applied mathematics at the McCormick School of Engineering and Applied Science, uses transportation data to develop models that better pinpoint the source of an outbreak and determine how the disease will spread. The ability to pinpoint with certainty the location of a pandemic outbreak and to predict where and how quickly it will spread would give governments and clinicians an important — and potentially life-saving — advantage in responding to the disease, but current prediction models are limited. Brockmann discussed his research on Saturday, February 16 in a presentation, “Are Pandemics Predictable,” at the American Association for the Advancement of Science (AAAS) annual meeting in Boston, Mass. Previous pandemic models have been based on geographical distance, but geography provides an incomplete picture of a pandemic. For instance, New York City and London are geographically very far apart, but with approximately 10,000 people traveling between the cities each day, the cities are far more connected than, for instance, New York City and Milwaukee, which are geographically closer. Using network theory and official transportation data, Brockmann developed a model that can generate with high accuracy the origin of an outbreak and the predicted arrival times of a pandemic in specific locations. The model can generate these findings using only data about the geographical location and number of occurrences of the disease. “Spatial disease dynamics become far more straightforward when viewed from the right perspective using our technique,” Brockmann said.